UK House Prices Bull Market Soaring Momentum, 10% Inflation by October? Prospective U.K. home buyers who may have been persuaded by the pseudo-economists, financial / economic journalists that populate the mainstream press as to the sustainability for any rise in UK house prices will over the past few months been finding themselves in an increasingly panicky state as UK house prices have literally started to soar as illustrated by the latest data and news out of RICS that reported that house prices are now rising at their fastest pace in 7 years, with their indices giving their best readings since November 2006. Similarly Halifax data shows the lowest mortgage interest rates in 14 years, with some fixed rates as low as 1.5% that is resulting in a continued trend lower in terms of borrowings costs as a percentage of average borrower income of 27%. According to the Halifax, UK house prices (July data) are now rising at an annualised rate of 4.6%, which is up from just 1.1% in March 2013. "House prices in the three months to July were 2.1% higher than in the previous three months. This is similar to the rates of increase recorded throughout the first six months of 2013. Prices in the three months to July were 4.6% higher than in the same three months last year, the highest annual rate since August 2010. Sales have also picked up with total purchase transactions for the first half of the year 6% higher than in the same period last year. "Signs of improvement in the economy, underlined by the recent evidence of a rise in gross domestic product in Quarter 2 and increases in employment, appear to have boosted consumer confidence. Greater confidence is likely to have underpinned the increase in housing demand. Official schemes, such as the Funding for Lending Scheme and the Help to Buy equity loan scheme, may also be raising demand. House prices are expected to continue to rise gradually through this year with only modest economic growth and still falling real earnings constraining housing demand and activity." The last time house prices were rising at this pace was in early 2010 in the midst of Labours debt fueled election bounce. Off course many will be thinking that all we are seeing now is a Conservative debt fuelled election bounce, but the key difference being that the election is still 2 years away. Therefore unlike Labour's short-term debt fuelled trajectory the timing of and maintenance of current house price momentum over the next 2 years will be more than enough for the UK housing market and economy to gain escape velocity beyond the depression that followed labour's election bounce which was as I pointed out at the time part of a scorched earth economic policy - 31 May 2009 - Labour Governments Bankrupt Scorched Earth UK Economy for the Conservative Government. In terms of what the house prices momentum implies based on Halifax price data (NSA), a healthy bull market will tend to oscillate between a trend of 4% to 12% per annum. Any higher than 12% then the market will begin to over heat with red warning signs around 20%, that would at least result in a pause in the market for as long as a year. Many readers may be surprised by such a bullish outlook, to hear that in just over 2 months time UK house prices could be soaring by over 10% per annum, and 12% for Jan 2014 data, but back in September 2012, as illustrated by comments and emails at the time, many were also skeptical of calls for a new bull market that was then just getting started. US housing prices are now rising at an annualised rate of over 12% which now puts the momentum for house prices firmly into strong bull market territory, in fact a goldilocks state that in my opinion could be sustained for many years, never mind months (i.e. a rate of about 12% per annum is sustainable). However any further increase in momentum and then that would result in the U.S. housing market overheating thus warranting a correction. Therefore the US housing market has some way to go to reach the point of a bubble peak, which means home buyers should take all of the commentary of this bull market not being sustainable, and for an imminent end, from clueless academic economists, financial commentary salesmen, and worse journalists who think they are clueless economists, with a house size pinch of salt, for they never saw this bull market coming in the first place and will likely only turn bullish just before the trend ends, as was the case towards the end of the last US housing bubble market. At the end of the day this all comes back to one thing and that is INFLATION, which is the consequences of governments printing debt and money to buy votes by whatever means possible, be it INFLATING the housing market or INFLATING the benefits culture, or INFLATING the public sector. Clearly one of the largest pool of vested interest voters are those who own HOUSES, then there is the far more costly benefits culture that includes, the non working, tax credits recipients and pensioners, that collectively consume some £230 billion per annum in benefits, approx 1/5th of which is financed through printing new debt. Therefore throwing an estimated £40 billion at the UK housing market per year is far more effective in terms bribing voters than another £40 billion thrown down the Benefits Culture black hole that would yield little return in terms of new votes for the tories. In reaction to strong housing market data, the mainstream press right from the Financial Times downwards has been busy bringing forth fears of a new UK house price bubble. This illustrates a press that only tends to connect the dots by looking in the rear view mirror as an explanation for why UK house prices have risen and why the end is always imminent, so as to generate scare mongering headlines to sell copy in suggestions for an unfolding bubble, which will turn out to be completely ignorant of the reality that the bubble phase could be as long at 10 years away! So whilst the mainstream press tends to flip, flop in their views following the release of virtually every piece of economic data, as I am sure that the same financial journalists and academic economists who have now jumped on board the latest housing data's band wagon will be found to be proclaiming its end and a new crash in house prices during a probably correction into mid 2014. Against which my own view has remained consistent as illustrated by the below graph that my expectations were for the UK housing market depression to come to an end by the start of early 2012, following which the UK and US entered into embryonic bull markets which gave golden opportunities for virtually a whole year to all those who cared to listen to buy properties at deep discounts in a buyers market. The actual signal for change from an embryonic bull market into a bull market proper came in September 2012 following the governments announcements proposing to double permitted developments for home owners, which had the near immediate effect of changing housing market sentiment long before the first building works could be commenced, as it would trigger demand for property with a view to extending as well as owners seeking to contract builders as I pointed out at the time right at the bottom of the UK housing market for 2012. The announcement was followed by further government measures that would boost sentiment long before the policies would be implemented in any significant number such as George Osbourne's March budget announcement to effectively create a UK subprime mortgage market by paying 20% of the deposit on first new builds and from 1st of January 2014 all properties upto a value of £600k. As mentioned above, this scheme will be extended from the 1st of Jan 2014 to allow prospective home buyers to buy ANY property (not just new builds) with the government financing 20% of a deposit upto £600k, or £120k of tax payer money going towards EACH prospective buyers home purchase, which EFFECTS market sentiment in the PRESENT. Successive Labour governments and to a lesser extent Conservative governments have succeeded in turning Britain effectively into a nation of scroungers, where the most extreme manifestation of which are the 8 million who can work but as a life style choice choose not to work, which has contributed towards literally millions of immigrants arriving over the the past decade or so, an estimated number that is 20X the number forecast by the politicians and their academic statisticians, resulting in record high employment numbers whilst high unemployment numbers persist. You want a FREE £200k+ House? Then come to Britain, and we will give this and much more, only thing you need to do in return is to vote Labour. Was the rallying cry to potential Labour voting immigrants. The net effect of the benefits culture is that for MOST working families, at the time of the last election it was far, far better to park themselves onto benefits than to work, the resulting £230 billion total benefits bill of which at least £40 billion is out and out fraud as a consequence of those that could work making a life style choice to instead become baby making factories to maximise benefits without consequences for the impact of having children that they have little intentions of actually looking after has on wider society. 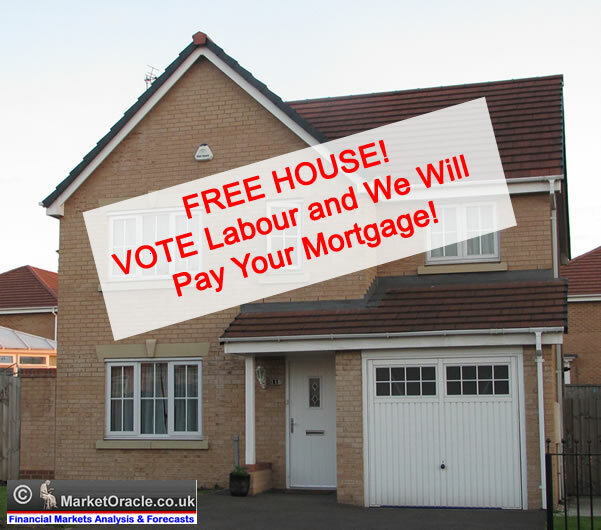 One such manifestation of the rampant benefits fraud is Labour's Support for Mortgage Interest (SMI), which the Labour government introduced to bribed to create approx 240,000 additional vested interest voters. The public spin on SMI was that it supports those who become unemployed, paying the interest on mortgages for upto 2 years of upto £200,000 at a flat rate of 6.08% which translated into a maximum benefit of £12,160 per year on top of ALL other benefits. This despite the fact that the policy of zero interest rates had long since pushed mortgage interest rates to about HALF the amount of benefit being paid out! So the tax payer had been effectively paying Interest AND Capital on typical mortgages at rates of 3%, this covering interest on a mortgage of upto £400,000! The Collation Government eventually cut the interest paid from 6% to 3.63% which still amounts to an annual benefits payment of mortgage interest to a maximum of £7,260 for what amounts to a life-time of mortgage interest payments. 1. Those through no fault of their own who lose their jobs with sizable mortgages, are going to be LESS likely to take on similarly paid employment in the future again due to the impact of this mortgage benefit i.e. a family of 5 (2+3) on benefits would need to earn an estimated gross income of more than £32,000 to over come the total amount of benefits that they are likely to be in receipt. 2. It encourages benefits fraud in terms of staying on benefits for life whilst encouraging under-declaring work i.e. as self-employed cash in hand so as to maximise benefits, as it is relatively easy for benefits fraudsters to overcome the 2 year time limit such as switching to claim income support for low income and working less than 16 hour work weeks or claiming that they have a disability. 3. The benefit is not only available to those of working age but also to pensioners upto a £100k mortgage, this defeats that whole purpose of what the benefit was said to be for, i.e. as a temporary support for those who become unemployed, when more than half the claimants are pensioners, which effectively means that the tax payer is paying for the next generations inheritance rather than prompting the downsizing and freeing up the housing stock which the likes of the bedroom tax encourages. 4. It encourages systematic benefits fraud in terms of citizens and also acts as a beacon to attract immigrants who have already mapped out how they will proceed to defraud the system and achieve their goal of obtaining a property with an over £200k mortgage so as to maximise benefits income potential whilst engaging in undeclared work as the state supports their children whom they live with but don't live with to further maximise benefits. This is one of the reason's why immigration to the UK has been about TEN Times that the last labour government promised it would be. The above are just 4 examples as there are many more variations to this fraudulent benefit such as paying for second homes i.e. towards buy to let property portfolios. The coalition government is desperately attempting to unwind labour's benefit for life culture through several mechanisms including introducing a £25,000 benefits cap and the bedroom tax, thought both of these are repeatedly watered down to dilute savings on the annual benefits bill or to entice those that could work to actually start to contemplate working (legally). The problem that the coalition government faces is that it is relatively easy for the Labour party to promise the electorate debt fuelled bribes over responsible government the price for which is ultimately paid for by inflation. Therefore the more responsible the coalition movement acts, the less likely they are to get re-elected. Which means times-up ! Get ready to expect just as big voter bribes during 2014 that the last Labour government made which translates into INFLATION. The coalition government response was to continue to bribe voters by extending the SMI scheme into 2016. This effectively acts as another significant prop for UK house prices. Bank of England 0.5% Interest Rates for More 3 Years? "We won't even begin to think about raising interest rates until we see the unemployment rate go to 7%" - Mark Carney. With that the new Governor of the Bank of England did away with over 4 years of Mervyn Kings smoke and mirrors propaganda of temporary emergency low interests of just 0.5%, and money printing of £500 billion, the consequence of which is theft of purchasing power from savings and worker wages by means of high real inflation, transferring this stolen wealth to the bankrupt banking crime syndicate, and the government so that it can continue to maintain vested interest voting blocks, by bribing the electorate with debt and printed money that is not backed by any economic activity. 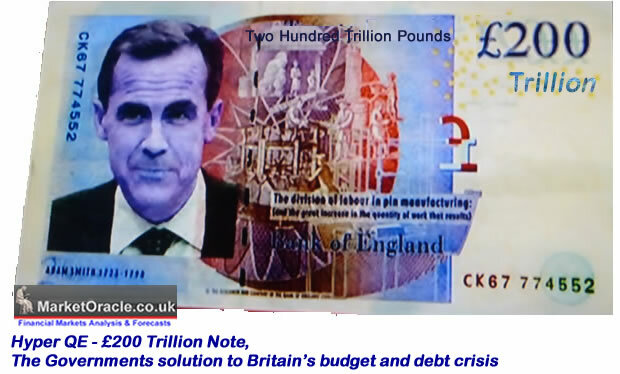 The current unemployment rate is 7.8%, and the BoE forecasts it will take 3 years to get it to 7%, therefore Mark Carney announced that the policy of near zero interests will remain for at least another three years so as to to finance government deficit spending (debt interest), continue to funnel cash into the banking crime syndicate, and force the increasingly depressed savers to throw in the towel to either invest in assets such as housing or go on a spending / consumption binge in an attempt at inflating the economy through the services sector so that many millions more low paid service sector jobs (wage slaves) can be created so that the government and the Bank of England can claim success at having reduced the unemployment % rate, because they know that it is impossible for Britain to create high paying manufacturing jobs in any significant numbers due to intense competition from Asia at near 1/10th Britain's wages, and as a consequence of technological advances such as robotics which means that there will never again be the level of demand for blue collar workers as there was up until the mid 1970's, as factories will continue to become more automated, thus the trend will continue towards requiring fewer and fewer high paid manufacturing workers. Mark Carney's governorship therefore represents a case of business as usual which means a continuation of the official policy of rampant money and debt printing in perpetuity, the consequences of which is the ongoing exponential inflation mega-trend that currently manifests itself in an official inflation rate of 2.7% CPI, though real inflation tends to average between 1 to 1.5% above the highly suspect official rate therefore at between 3.7% and 4.2%. An average rate of 4.5%, with a trend oscillating between a rate of 7% to 2.5%, which is the probable UK inflation trajectory over the next 5 years, with real inflation averaging at 6% per annum. As most of the new jobs created will go to more productive and hard working immigrants, whilst the unproductive, lazy, de-evolving unemployable benefits for life class, will largely continue to remain unemployed, the net effect is that for a slow decline in the official unemployment rate, coupled with huge demand for resources such as housing created by continuing high immigration, therefore expect a much higher inflation rate than most can imagine today. Expect when UK Unemployment falls to 7% for the UK Inflation rate to have also risen to 7%. Savers are left with little choice, either keep their cash in the bank and continue to have it systematically stolen by means of inflation or leverage themselves to inflation by primarily investing in the housing market. Soon even the dumbest of savers will be able to do the maths by figuring out the difference between 1% return on savings in the bank compared to 10% increase in property capital values per annum. So, according to the Bank England the next interest rate rise is at least 3 years away. Well I'll let you you into a little secret, and that is when the government or one of its institutions makes a definite statement that x is going to happen for many years, a bandwagon on which over 90% of the media jumps onboard, then there is a very high probability that the exact opposite is going to happen! Therefore forget about 0.5% UK interest rates in 3 years time, far more probable is 4.5% interest rates by the end of NEXT year! 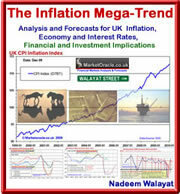 This is not something that I've plucked out of thin air but is based on the conclusion of my long standing analysis dating back to March 2011 (08 Mar 2011 - UK Interest Rate Forecast 2011 - Conclusion and Implications - Part 2 ), I even wrote a whole ebook explaining why I expected UK interest rates would rise to 4.5% by the end of 2014. (The Interest Rate Mega-trend - FREE DOWNLOAD). Which implies significantly HIGHER mortgage interest rates than anyone expects today. The point is that the Bank of England does NOT control interest rates, instead interest rates are controlled by the money markets. All it would take for interest rates to rise is for a relentless flow of foreign currency out of the UK. The reasons for which will become apparent with the benefit of hindsight, which I can only speculate about at this point in time, such as worsening inflation expectations, or that the flaws in the Euro-zone are fixed, or any one of a 10 other possibilities, which I am sure the academics looking in their rear view mirrors will happily write about for many years AFTER the fact! Off course when interest rates rise by the end of next year the academics and the mass media that have swallowed the 0.5% interest rate economic propaganda hook line and sinker will all suffer collective amnesia and march on as though they had always anticipated high UK interest rates all along, as will Mark Carney at the Bank of England. I am sure that many people reading this will naturally conclude that higher interest rates will be a big negative for the housing market that could imply a bear market or even market crash. I am sure such expectations will become prevalent in the mainstream press as soon as interest rates start to rise, but I am going tell you now, long before even the first interest rate hike takes place that interest rate hikes are NOT going to make ANY difference to the housing bull market, for the rate rises would reflect a normalisation of the UK interest rate market and NOT a panic event. Again the primary driver will be SENTIMENT! When house prices are rising at a pace that is more than people earn, will their mortgage costs rising by approx 1/3rd make such an impact on sentiment? I don't think so, not by the end of 2014 when the UK housing market will be rising by at least 10% per annum, or on average prices of £230k of about £23k per annum! TAX FREE! (own properties). 1. Prepare for interest rate hikes long before anyone in the mainstream media or academics can imagine today. 2. That the rate rises will NOT result in a bear market or worse a crash as the trend momentum by then will have a couple of years under it's belt and the longer a trend goes on the more likely it is to continue towards the final blow off bubble stage, that would still be many years away. 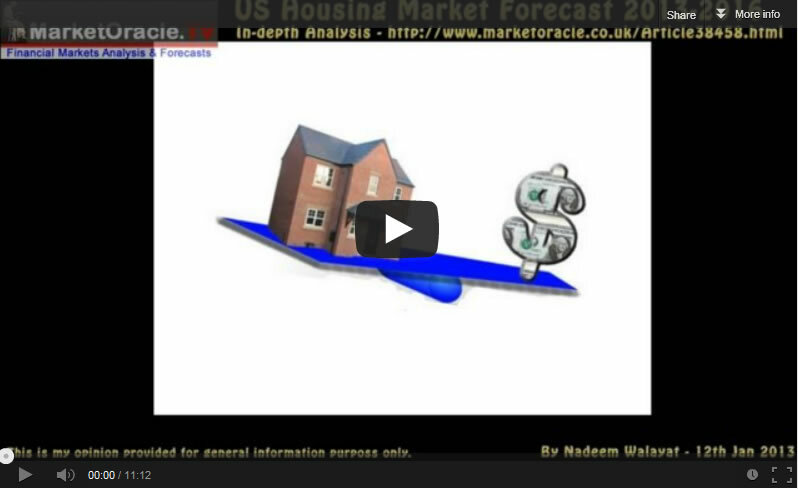 My expectations are for the UK to follow a similar trend trajectory as that of the US as per my analysis and concluding trend forecast of January (12 Jan 2013 - U.S. Housing Real Estate Market House Prices Trend Forecast 2013 to 2016), that forecast US house prices to target a rise of 30% by early 2016 as illustrated by the original graph below. This analysis was also accompanied by a youtube video version. An updated graph for the case shiller US house prices index shows that the US house prices are now soaring, clearly this parabolic trajectory is NOT sustainable, so I am expecting the pace of US house prices growth to moderate over the coming months to oscillate around my expected trend trajectory. Still this should act as a warning shot across the bows of all those who are WAITING to buy, as such indecisiveness could prove very costly! Ensure you remain subscribed to my always free newsletter for my ongoing in-depth analysis as I attempt to map out a probable trend trajectory for UK house prices for the remainder of this decade. Military coups, do what military coups do, which is to slaughter innocent protestors, and imprison any left alive who continue to protest for freedom. And so the Egyptian military continues to commit massacres after seizing power some 2 months ago, where the death toll has risen to a minimum of 1000 civilians, ranging as high as 10,000. In response to which the so called leaders of the free world, in the name of democracy gave press conferences giving mealy mouthed mild reactions to the deaths in Egypt, some 2 months on from when the COUP took place. Instead for 2 months the US and UK have supported the MILITARY dictatorship in its COUP against an democratically elected government. 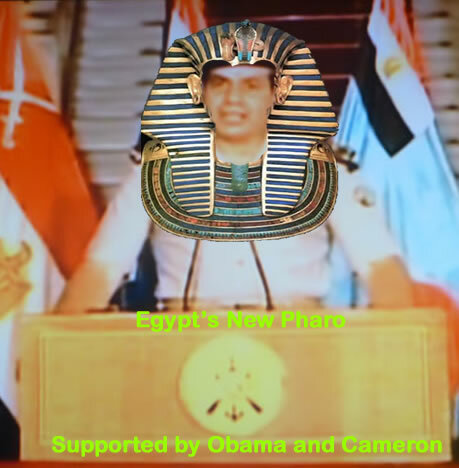 The mainstream media in large part has played its role in pumping out propaganda in an attempt to negate the fact that the Morsi government was ELECTED, and barely given a year in power before it was brutally crushed, this may have succeeded in some degree to convince the western audiences that the Egyptian Military are justified in their killing of democracy in Egypt. So, whilst our two faced politicians play politics with another military dictatorship that as a matter of fact slaughters civilians by the thousands, in response to which all we as individuals can do is to show our outrage by boycotting all goods and services that support the Egyptian Military dictatorship, which primarily means boycotting tourism. Hi Nadeem, another thought provoking article, but the point about interest rates to me is not that it may go to 4%, but 15% in the face of a currency/bond crisis as has happened in the past. The BOE cannot buy every bond forever and as you say ultimately they do not control rates anyway. A rise to something like early nineties levels of rates I think would definately affect the landscape. Having said that, for the next few years untill that happens stocks in good homebuilders may be a good buy but not risk free. Yes, many years from now a spike to 15% is possible. Would you recommend to buy more properties at this time? Also knowing nothing about stocks and shares where would you suggest investing? As you have experience of Buy to let that would be where to focus on. What I would do is go for is the higher end of the market rather than low value, poor location properties, as the higher end will see a greater % capital gain for less work. As for shares, if you know nothing then its best not to get involved as stock market investing is very high risk and thus there is a high probabiity you would lose rather than make money. First and foremost you've been spot on in your forecasts both on the macro inflationary picture and on real estate. Thank you for such vision amongst a sea of deadbeat academics spewing nonsense and making predictions from the rearview mirror. As an owner of residential real estate in CA and AZ, all at low fixed rates, my question to you is your rationale behind the possible goldilocks state wherein 12% annualised returns are possible. Watching the 10 year yield in the US nearly double in a matter of a few months has me concerned about a future spike that is looming and one that could be a slap in the face of the multi year bull run in residential real estate. What is your opinion as far as the threshold of rate increases that would halt the bull market in real estate? At what point do we hit the sell button with respect to rates? And to conclude, it's humorous to see Schiff being quoted among your report with his call of the end to the "new bubble" in real estate. Maybe he'll turn out correct.. in 2017, 2018? It is not possible to determine that because it all depends how high sentiment goes, for instance if prices are rising at 20% per annum then that can far out weigh even 10% interest rates. If you look at my UK graph, you will see how sentiment tends to play out to the final euphoria stage.